The summer that my oldest daughter turned four, we decided to take her to the East Coast so she could dip her toes in the Atlantic Ocean. Our family had never ventured to this part of the country, so we wanted to add some familiarity to our trip and quickly decided that Disney’s Hilton Head Island resort, located in South Carolina just 5 hours from the Walt Disney World Resort in Florida, was the obvious choice. Here are some highlights and top reasons to consider this Atlantic Ocean Hidden Mickey Gem for your next beach vacation! As with any Disney trip, the top-notch customer service that you receive is invaluable. All of the Cast Members that we encountered were helpful, friendly, warm, engaging, and thoughtful. Disney also knows how to cater to your children in engaging activities such as: campfire stories and signing, movies under the oaks, bingo, etc. Make sure you check with the front desk upon arrival to get a list of all the activities that are available during your stay. Our daughter really enjoyed the tie dye activity located by the resort pool. Kids got to pick between a t-shirt and a pillowcase and the Cast Members that were helping were so hands on and encouraging. When we first got there she was pretty nervous about trying the slide, because it’s a tunnel that shoots you out in to the water below. The Cast Members that were on duty lifeguarding noticed her hesitancy and offered her a button which read, “Queen of the Slide” and told her she would be Queen for the day if she tried it once. Yes….there is pixie dust in South Carolina, too! Needless to say, that was the only incentive she needed. She then proceeded to tell everyone at the resort she was Queen of the Slide for the day. There is a shuttle system to take you over to the Beach House where there is a pool, but it is pretty straight forward. The Beach area is gorgeous and easily accessible from the Beach House. The whole setup is convenient and comfortable. We LOVED the guided nature walk that we participated in as a family. It was enjoyable and informative as your tour is lead by naturalist guide. We loved learning about the costal marine life and the beach itself. There area MANY other activities available to your family including a dolphin discovery, kayaking, bikes and other beach rentals, and a guided fishing tour. Your favorite A Time To Treasure Travel Agent could set up any of these adventures for you through the resort! When we traveled to Disney’s Hilton Head Island Resort, we had a total party of 5, which included 4 adults, so we opted for a 2-bedroom villa. We had AMPLE room to stretch out and not be on top of each other when we retreated to our room each night. We also had great proximity to the pool area at the resort, and it’s such a small resort area in comparison to other Disney Destinations, I can’t really imagine a bad room location. We had a full kitchen and laundry as well which also contributed to the laid back, beach, lazy days vibe. My husband and I often talk about how much we enjoyed our time at Disney’s Hilton Head Island Resort. 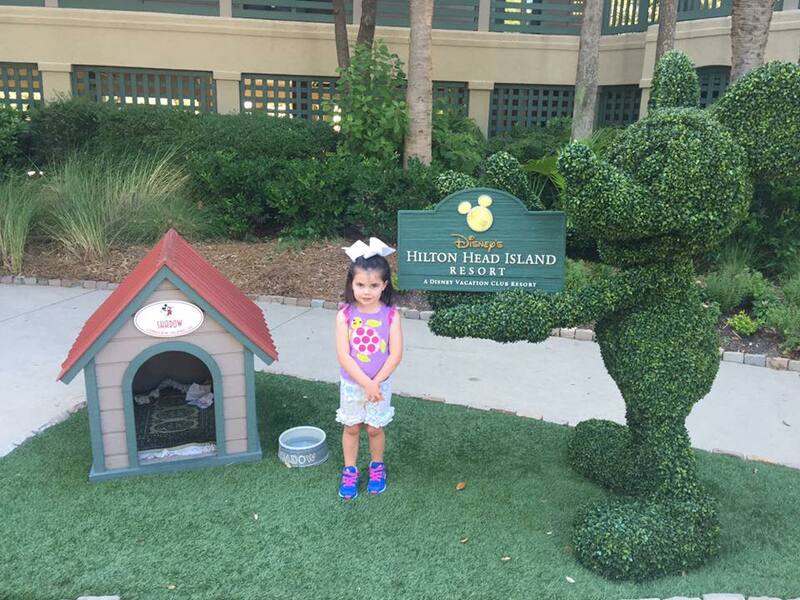 This resort provided a relaxing beach vacation with Disney Magic and Customer Service. I can’t wait to go back to visit and take our youngest daughter to introduce her to this beautiful landscape and enjoy some family time. I think my oldest will just be happiest to show her the slide of which she is still Queen — she still has the button to prove it! Do you have questions about this Disney Destination? Post in the comments below or contact your A Time to Treasure Travel Agent for more.